Just a real quick blog before I forget. In the latest APEX Listener 2.0.4 patch, there's support for nested cursors. There is two gotchas. First make sure to to disable ( make 0 ) the pagination of the REST definition. The second is this only works at the top level, so not nested nests of nests. 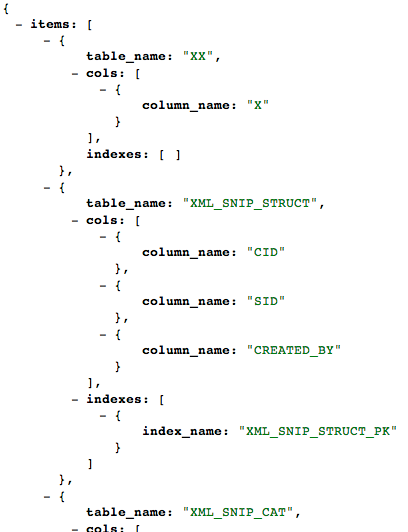 This is a very quick example of tables and nested in each table the columns and indexes that tables has. The resulting JSON looks like this.